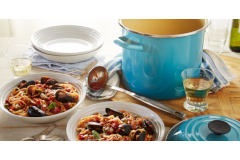 Le Creuset makes a variety of vessels for stock. 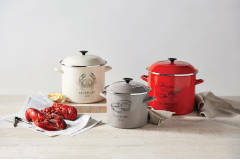 The Enamel on Steel Stockpots are made of heavy-gauge steel glazed with a vibrant porcelain enamel and are perfect for everything from boiling pasta to steaming shellfish. 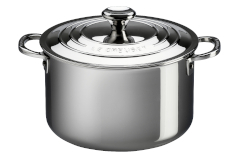 Its tall design and tight-fitting lid create an environment that limits evaporation while infusing heated liquids through ingredients. 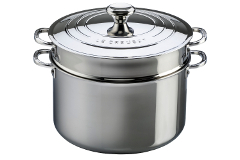 The Stainless Steel collection includes several sizes of stockpots and casseroles perfect for large portion cooks.